It's time for another episode of 205 Live on the WWE Network! Kalisto continues to make a splash in the cruiserweight scene as the fun loving LUCHA! LUCHA! champion of the division, but many eyes are gunning for his world title prize. Tonight Kalisto teams up with Mustafa Ali against Enzo Amore and Ariya Daivari. Who will gain momentum before WWE TLC? Hit F5 or refresh for the latest updates while the show is in progress! Last night on Raw, Enzo Amore complained about losing the Cruiserweight Championship to Kalisto, then orchestrated a beatdown on him with Ariya Daivari, Tony Nese, Drew Gulak and Noam Dar. Mustafa Ali tried to help the champ out, but he too got beat down. That leads to tonight's tag team main event. Also, Rich Swann will face Jack Gallagher in singles competition. Enzo Amore dances to the stage and does his usual introduction. Enzo Amore: "Can you smell that, Seattle? Can you smell it? It smells like teen spirit. Tony Nese, Noam Dar, Drew Gulak, Daivari Dinero, and the quarterback! Everybody around me is getting money and I'm making Star-bucks, and I'm not talking about cappachinos. Speaking of coffee, last night I roasted that little coffee bean, but that's nothing compared to what I'm gonna do at TLC you little jumping bean. After what I do to you the only thing you're gonna be jumping is from channel to channel in your hospital bed. More likely the children's hospital in your gown and mask, sucking Jell-O through a straw. Look, there's Raw. Hey, grab an iPad, pick up WiFi, open the WWE Network, watch the 'Zo Show! I will be back with my girl, the Cruiserweight Championship. The foundation for 205 Live was rebuilt with this fist. I rebuilt it from the ground up. At least I'm original people. The only thing WWE did for me was hand me this microphone and I did the rest. He WWE universe, do me a favor, act like you ain't do me no favors. This is charisma at its finest. Something you don't got that, you don't got, and you don't got. And you can't teach this! You can love this, you can hate this, but what thing you can't do is cuff this. I'm on edge and I'm waiting for you to come push me. The reason why I'm on edge is not enough space..."
Kalisto comes out to cut off Enzo's shouting and rambling and takes him out. Enzo avoids the Solida Del Sol and walks back up the ramp. We get a video package highlighting the feud between Cedric Alexander and The Brian Kendrick, which involves Jack Gallagher turning heel starting by breaking his umbrella over Alexander's back. Last night on Raw, Cedric Alexander brought Rich Swann out to watch his back for his match with Jack. The Brian Kendrick comes out with the former, and Cedric Alexander comes out with the latter. We get pre-match comments from Alexander mentioning how Kendrick and Gallagher have been attacking him with "that damn umbrella." The bell dings, Swann puts his feet up in a corner, ducks under a leapfrog, flips over him, dropkick, punches him in a corner, Irish whip, floats over, and does a hurricanrana. Gallagher rolls out the ring, Kendrick pulls Swann out the ring on the other side, Gallagher heads over to him, rolls him back in, taunts Alexander, then puts Swann in a rear chinlock. Gallagher kicks him while he's down, Swann fights back with hard rights, Gallagher goes after the knee, slams his head on the turnbuckle, sets up a suplex, but Swann blocks it, lands on his feet, Gallagher dropkicks him and gets a 2-count. Jack covers again and Rich kicks out again. Gallagher puts him in the chinlock, Swann gets to his feet, Gallagher with a hiptoss, back to the chinlock, elbow to the head, Swann crawls to the ropes, Gallagher hits European uppercuts, Swann fires back with his own European uppercut, then they start trading European uppercuts and punches. Gallagher with a single-leg takedown, slams his knees on the mat, applies a toehold, then does a leglock. Swann kicks him off, clotheslines him two times, back kick, flipping legdrop to the back of the head, gets on the middle ropes, Gallagher sneaks up under him, Swann punches him to escape, delivers a toger driver and gets 1-2-KICKOUT! Gallagher ducks the superkick, Kendrick threatens to hit Swann with the ring bell, Alexander attacks him from behind, then ALL HELL BREAKS LOSE and the referee calls the match off! The match is thrown out but they keep fighting! Swann takes out Kendrick on the floor, Alexander hits Gallagher with the handspring enziguiri, Swann gets on the top rope, but Kendrick pulls Gallagher out the ring to save him. Alexander and Swann will take on Gallagher and Kendrick at WWE TLC. WINNER by DQ: RICH SWANN. After a promo video for WWE TLC, Drew Gulak heads to the ring for more of his PowerPoint Presentation. Gulak: "I am Drew Gulak and... I consider myself your father. And as your father it is my duty to guide and shelter each and every one of you for Drewtopia. I must shelter you from top rope dives and chanting. You people continue to defy me and thus I was forced to take action." Last week on 205 Live, Gulak attacked Tozawa's throat. "That's called tough love and it sounds like... I love 205 Live more than anything else, and I will not let anyone defy me like Tozawa with his AH, AH, AH! I'll say this, sometimes you're supposed to speak softly and sometimes you carry a big stick. That is exactly what happned last week. I hit him in the vocal chords and make his voice impotent. Make no mistake, Akira Tozawa brough that upon himself. If he listened he would've seen Proposal #9 of my PowerPoint Presentation! Stop chanting, quiet down! Proposal #9: No Defying Authority. We call proposals rule. Despite when you kids have heard, rules are not made to be broken. STOP CHANTING! (The crowd chants "This is boring.") BORING? This is a PowerPoint Presentation! As your father, it is my duty to tell you there is no excuse. This Sunday, I will recite al 277 rules. This Sunday on TLC's Kickoff show, I will go through a championship edition of the Drew Gulak's PowerPoint Presentation for a better 205 Live!" Everybody comes out for the main event next. Enzo hands the microphone to Daivari who speaks Iranian. Enzo takes the mic back and says he understood him because they both speak the language of money. He then calls Kalisto and Ali "sawft." Kalisto and Amore will start the match, although Amore hides in the ropes, then tags out. Kalisto wants Enzo, Daivari slaps him, Kalisto with quick lefts and rights, the hits the Listo Kick and chases Enzo off the apron. Daivari comes from behind, Kalisto lands on his feet from a suplex, Ali tags in, double tam action, Ali gets a 1-count, knocks him down, tags the champ in, body slams Daivari, then Kalisto with a slingshit senton. Amore provides plenty of distractions to Kalisto than Daivari just shoves him out the ring. Amore gets in some cheap shots before the referee finally turns around and starts his count. Daivari is in control after Kalisto gets back in, Amore tags in, slams him into the turnbuckle, stomps him down, Daivari tags in, stomps a mudhole in him, Amore is back in with more stomps, then delivers a flatliner for 2. 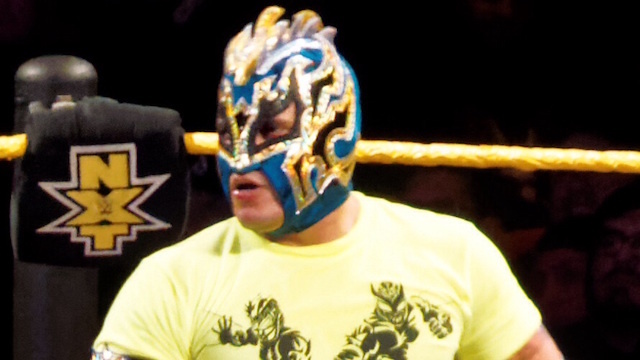 Kalisto stands at the ready, winds up, here's the pitch, and the punch connects. Kalisto fights back with punches, Amore backs him up and Daivari lowers the middle rope sending Kalisto out the ring. Daivari gets the tag, attacks Kalisto on the floor, rolls him back in, covers for 2, delivers a suplex, another cover for 2, puts him in a chinlock again, then tosses him out the ring. Kalisto blocks the wind-up punch, tries to fight them both off, but Daivari clotheslines him and gets a near-fall. Kalisto blocks a suplex, Daivari clubs him on the back, sets up the the suplex again, but Kalisto counters with a DDT. Both men are down as their partners want the tag. Both sides get the hot tags, Ali clotheslines him a few times, pop-up dropkick, Irish whip reversed, slips onto the apron, kicks him in the head, connects with the slingshot neckbreaker Amore blocks a top rope hurricanrana, Ali dropkicks him in mid-air, covers, Daivari breaks up the count, Kaisto makes the blind tag, and Ali takes out Daivari with a corkscrew plancha. Kalisto hits Amore with a diving crossbody from the top, Amore rolls through with a counter, then Kalisto hits Amore with the SOLIDA DEL SOL!! Kalisto covers and gets the 3-count. WINNERS: KALISTO and MUSTAFA ALI. Celebrating his victory was NOT enough as he hits Amore and Daivari with a suicide dive! Ali even gets in a shot, but they eventually break away from each other and save it for Sunday. That's all for 205 Live!